"be quiet and still and allow it all to come, all is perfect!" 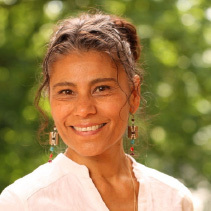 Katiza Satya, born in Chile, is yogini in heart and soul, spiritual teacher to many, and a warrior for peace. Foremost, she is a woman, a sister, a partner, a mother and a grandmother with all her heart. She would describe her ‘life work’ as inviting human beings to discover who they really are. In this, she has dedicated her life to Truth, which can be felt wholeheartedly in her teachings and simply by being in her presence. Satya teaches yoga, meditation and Satsang to support us in embodying the nature of who we are, allowing our individual and collective potential as human beings to awaken. She invites us to enter the illusory gate that has kept us separate from our natural human nature. With her help pointing us towards where we can find the only and supreme treasure awaiting for each of us: true peace, true love, true joy and true liberation. Satya is a protector and gatekeeper for more than two decades of many great ancient wisdom teachings of yoga in different traditions, that support us to find harmony between body, energy, and mind. These ancient sacred teachings prepare us to enter the nature of our true human mind. To her, Motherhood has been the biggest initiation in true Love, her true calling. This is reflected in the way she holds the space so truthfully for others, which makes her the kind of mother all mothers want to be held by. In times of turmoil she would advise others to be quiet and still and allow it all to come. If she could tell her younger self something it would be: all is perfect!